The Jazz Ambassadors, conducted by Chief Warrant Officer Gordon K. Kippola, will join the Columbus Symphony and CSO Resident Staff Conductor Albert-George Schram to open the Nationwide Insurance Picnic with the Pops 2011 season. The internationally acclaimed Jazz Ambassadors travel thousands of miles each year to present jazz, America’s national treasure, and carry a message of patriotism and goodwill to audiences worldwide. The 2011 Nationwide Insurance Picnic with the Pops presents the Columbus Symphony with the Jazz Ambassadors at Chemical Abstracts Service (2540 Olentangy River Rd.) on Saturday, June 18. Gates open at 6pm. Concert begins at 8:15pm. Tickets are $20 for adults and $8 for children ages 3-14 when purchased by phone at 614.228.8600, online at www.PicnicWithThePops.com, in person at the Ohio Theatre Ticket Office (39 E. State St.), or at the gate on the night of the performance. Children 2 and under are free. Discounted adult tickets are available at central Ohio Giant Eagle locations for $18. This performance is made possible through the generous support of title sponsor Nationwide Insurance and host, Chemical Abstracts Service. Additional support is provided by presenting sponsors The Blackwell, Catering by Design, John Gerlach & Company, LLP and Live! Technologies, Inc.; concert sponsors Giant Eagle, Lasting Impressions Event Rentals, Messer Construction; and supporting sponsors Donatos Pizza, Graeter’s Ice Cream, Hamburg Fireworks, and Heidelberg Distributing. The Jazz Ambassadors are the United States Army’s premier touring jazz orchestra. 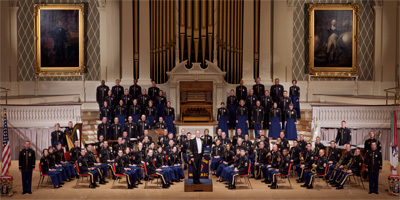 As a component of The United States Army Field Band of Washington, DC, this internationally acclaimed organization travels thousands of miles each year to present jazz, America’s national treasure, to enthusiastic audiences in every state in the nation and around the world, keeping the will of the American people behind the members of the armed forces and supporting diplomatic efforts around the world. Since its formation in 1969, the Jazz Ambassadors have appeared in all 50 states and throughout North America, Europe, and Asia. They have also made appearances at Nice Jazz Festival in France, the Montreux Jazz Festival in Switzerland, North Sea Jazz Festival in The Netherlands, the Jazz and Heritage Festival in New Orleans, and the Newport Jazz Festival in Rhode Island. A group discount is available for parties of 10 or more. Call 614.228.8600 for more information. Center stage tables are available for purchase. Tables are sold in parties of 2, 4, 8, or 10, and range from $50-$850. Catering is not included. Prime location lawn space may also be reserved for groups of 25 or more. To reserve tables or preferred lawn seating, call 614.228.8600.